Comm Eye Health Vol. 26 No. 84 2013 pp 64. Published online 20 December 2013. For children to have adequate micronutrient intake, including vitamin A, all of the following should be in place. Nutrient-rich foods must be available to the family. Sufficient nutrient-rich foods must be available where the family can buy them, and must be affordable. Children must consume enough nutrient-rich foods. Children must be given enough nutrient-rich food to eat. Food must be prepared in such a way that the nutrients are preserved and easily absorbed. For most foods, this means not overcooking them. For good vitamin A absorption, there must also be enough fat in the diet. Children must be free from disease and infection. Measles, intestinal worms, diarrhoea and other infections all reduce the absorption – and increase the loss – of many micronutrients, including vitamin A. 1 Nutrient-rich foods are not available or affordable. some foods, such as meat and other animal products, are not affordable for poorer families. 2 Nutrient-rich foods are not given to children, are not given in the correct way, and/or children do not want to eat these foods. if there is not enough food for the family, the more nutritious food may be given to the head of the household. 3 Children suffer from disease and infection. increase the loss of nutrients from the body. measles infection. Vitamin A is needed to repair cells damaged in the skin, lungs, gut, mouth, conjunctiva and middle ear. In children with inadequate vitamin A intake, measles infection can very quickly deplete the body’s vitamin A stores (in the liver), leading to blindness, hearing impairment and death. diarrhoea: micronutrients are lost from the gut. measles: retinol is lost in the urine or from the gut. inadequate health services, including low coverage of measles immunisation programmes and a lack of primary care. Figure 1. 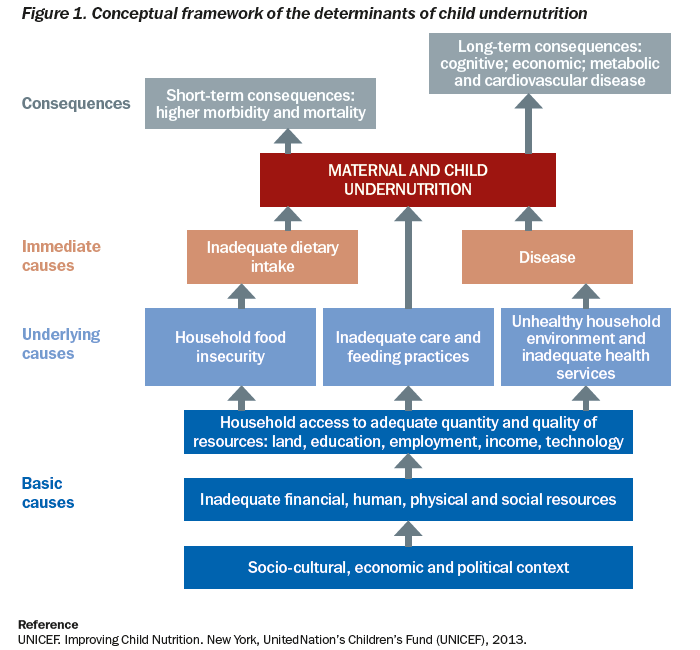 Conceptual framework of the determinants of child undernutrition. UNICEF. Improving Child Nutrition. New York, United Nation’s Children’s Fund (UNICEF), 2013. These causes are themselves the result of more basic causes, e.g. a lack of access to resources including income, education, land, and technology. The social, cultural, economic and political context people find themselves in also plays a role. Although these causes are difficult to address, as eye care providers we can do much to address misconceptions and improve knowledge about nutrition among parents and in communities (see pages 72–73). We can promote good hygiene practices, measles immunisation and deworming and encourage parents to give their children a diet that is nutritious and rich in micronutrients, including vitamin A.
UNICEF. Improving Child Nutrition. New York, United Nation’s Children’s Fund (UNICEF), 2013.